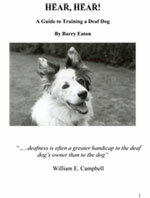 Barry has a wealth of experience in dogs, dog training and dog behaviour and has authored two excellent dog books. You may have read books or seen TV shows that tell you that your dog will seek to dominate you and your family members unless you become the “alpha” and put him in his place. The theory is that since dogs evolved from wolves and wolves form packs, supposedly with strict pecking orders and battle each other to become the pack leader, your dog will do the same within your household. ‘Dominance in Dogs’ separates out the facts from the fiction regarding dominance in pet dogs presenting the reader with the results of research into the behaviour of wolves and the impacts of selective breeding on the behaviour of domestic dogs. Training a deaf dog is no different than training a hearing dog if you go about it the right way – and ‘Hear, Hear’ explains to the reader what the right way is. The training methods explained in the book are all rewarding and motivational so the dog enjoys the experience of being trained. All you have to do is substitute verbal commands for visual ones. ‘Hear, Hear’ will take you step-by-step through basic dog obedience exercises resulting in an obedient, well behaved dog. Once the dog has learnt the obedience exercises in the book, the reader should be able to let their mind run free and explore other exciting, fun things to do with their deaf dog. The sky’s the limit!